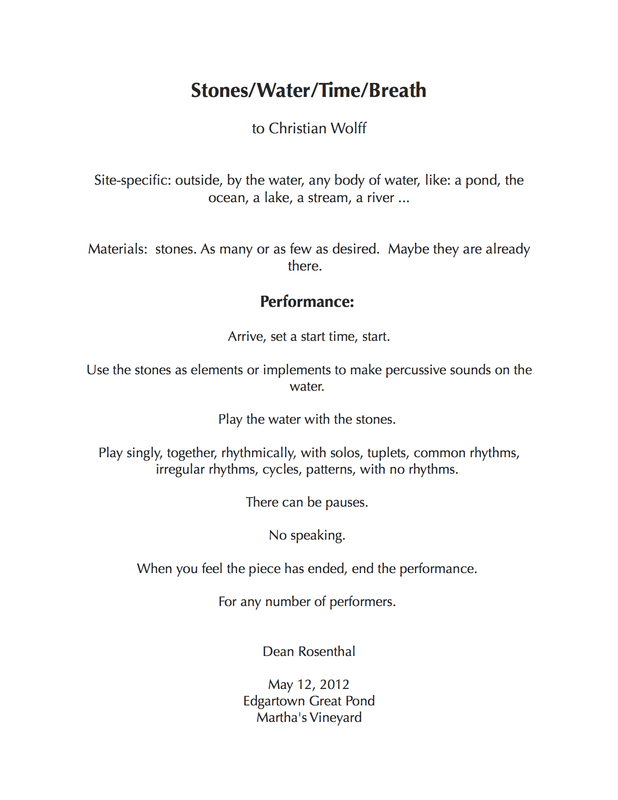 STEP 1: Score for Stone/Water/Time/Breath, by Dean Rosenthal. 2a. "Stone/Water/Time/Breath", an interpretation by Russell Craig Richardson. This is a performance of Dean Rosenthal's score from January 26th, 2013 (above), by Dorota Czerner (standing to the right of the camera) and Russell Richardson (standing to the left), about an hour before sunset. This piece is a response to Dean and Karin Rosenthal's performance of Dean's score (above); scroll to the end of this page to view this piece from which Russell's derives. The asterisk refers to the unfortunate tendency of the 'water' to go through mood changes according to the weather... today 23˚F with a windchill factor down to 11˚F. Fortunately, the artists reported that they were in the lee of the wind, down by the lakeside. 2b. "Black Water", an interpretation by Russell Craig Richardson. Cooper Lake NY, Full Moon, 21:00 to 22:00, March 27th, Spring, 2013 — a second response to Dean Rosenthal and Karin Rosenthal's performance, mentioned above. The asterisk in the titles refer to 'taking liberties' with the water; namely, that the winter version used hard water (ice...), and the spring equinox version uses dark water (at night). DEAN: So this is the start of our dialogue about the piece and the videos interpreting or expanding upon my score "Stones/Water/Time/Breath.” I was wondering, what drew you to the score with respect to making your own works from it? I was utterly thrilled when I first watched it. I had never imagined interpretations like yours. RUSSELL: What I liked about your score was its simplicity, which seemed nevertheless quite lapidary. It was clear, yet allowing for a huge interpretive element: something about the concept being 'full of space' in the same way that the eventual piece is. There's also — I’ll put this up front — two quirks in the way I work, or want to work: first, I am not a 'conceptual' person. In fact, I'm almost opposed to bare conceptualization (it is only half the work); second, independently of the aforementioned, I try to integrate as much physicality and 'the concrete' of performance into my own video pieces. It's very easy to get something on video, just by turning the camera on, but I have found that a certain sterility can creep in, precisely because the whole process can seem automatic. So, having thought about your 'ground conditions', Dorota Czerner and I tried to imagine a situation where we could integrate some of the random restrictions of an actual shoot, then work the piece around those restrictions.The first point was to make the piece unfold in real time: the performance would not use in camera editing or shot changes. In other words, this would be a mise-en-scène, not a montage venture. I tried to be as alive and alert as possible to the actual conditions 'in situ' — situations which are as variable as waterscapes and seasons. The second point was to accept, within reason, the existing over the planned — i.e., to shoot the piece as soon as possible, accepting what we would find, rather than molding the shoot to the imagined. The interesting fact at that moment was that, in winter, the lake we wished to use was frozen over. This in itself posed no real problem, as the whiteness and blackness is what I wanted to play with (snow = good), while the actual noise of the rocks on ice is interestingly different to what one might expect from 'stones and water'. The severe cold of the shoot, and the physical strain of amassing enough stones and throwing them off to the 'hole' in the ice (50 yards away), gave Dorota and I ample opportunity to demonstrate 'breath'. That was the first piece, which I edited in sequence the same evening. The triple screen was dictated by the locale and the image's own insistence that various frame shapes be included. The only way to do this — without making a linear work — was to fold the various images ('takes’) into one triptych. This, obviously, folded the element of time in on itself, too. What I like about this piece is that the three panels actually employ different time-spaces. It's hard to notice, but the lower panels actually freeze while the 'action' takes place alongside them. The sound, however, is continuous. I like the fact that the exigencies of the shoot imposed very simple solutions which are, while appropriate, actually quite convoluted ways to reach this simplicity. I think Bresson talks about this as being the desired goal in his films: complex maneuvers leading to a simple aspect. Sadly (or implicitly?) I do not work from a score at all. This was a very attractive instance of having an actual performative video. That is, I had an interpretable score, but every concrete element was left to my interpretation. So, I tried to be as alive and alert as possible to the actual conditions 'in situ': such as situations which are as variable as waterscapes and seasons. DEAN: What you are talking about here seems to be another measure of the flexibility I intended. I think what can be nice about the set of ‘ground conditions’ the piece has built into it is that there is the open space within the text to offer the interpreter room for movement. None of this is conceptual. What can be considered to be ‘first principles’ is exactly right. In your interpretations, in your work, the idea for me as composer may be to completely remove myself. And that seems to be what allows the collaborative aspect of these works to exist. Russell Craig Richardson, by Marie Uridia. I was struck by the examples of ‘breath’ you chose to describe: severe cold and physical strain. “What might this mean?” I wonder. If I said I had little idea of what I imagined the title would evoke in others when I made it up (the title is possibly the only non-deliberate detail in my piece), I may have left a door open. And so as composer, these details that you describe make me think of environmental and physiological facts. And, I very much receive that: that's a nice example of "breath". Sometimes the intuitive flash of inspiration can be very effective. The use of mise-en-scene and triptych in this instance is brilliant, in my view. As you observe, the piece can be considered to have a simplicity within a deeper statement, and, the idea of "fixed" elements of composition subtly brings out both the simplicity and the deeper statement. Lastly, the acceptance of the unfolding of the event, in contrast to the planned, is probably keeping best within the original intention of the notation. There is an element of openness that was indicated originally and that unwritten indication is clearly respected. Of course, that openness could be considered to allow for an organizational method, but really, I want to let the music and the experience breathe, as you have. RUSSELL: There is an interesting conversation to be had further down the line about what might be considered 'conceptual'. In video work, I think, as we are literally only dealing with surfaces, light and (maybe) intention, the 'conceptual' is anything which doesn't actually instruct those 'real' elements. And, so with respect to the ‘ground conditions’ we are discussing, what I respond to is that the score allows those ground conditions also to be interpreted concretely. But with respect to the composer being removed from a concrete response, I’m not sure I believe that is either possible or desirable for the composer to be completely removed. What intruded was the sound of the wind: at times peaceful and recognizable, at other times overloaded, distorted and, I would say, embodying an anger. We are also discussing what the conditions of severe cold and physical strain referred to may be: 1) this simply means that the conditions of the shooting were very cold; 2) that digging up rocks is a tiring physical activity; 3) that throwing the larger rocks the required distance (we quickly established that the smaller rocks did not have enough momentum to carry them out to the 'hole' in the lake) meant that the two of us, but especially myself, were gasping and panting, and these sounds of physical exertion can be clearly heard on the soundtrack. With respect to the triptych: the framing and the physical forms dictated — or strongly suggested — the triptych form. Then I realized that the three sections were overlaying sequential time, so we have here a ‘time triptych’, not just three visual images. If you watch each section carefully, you can see the relative changes in the quality of the light — and deduce in which order the three panels were shot. You can also see the necessary error (like the deliberate errors in the weave of a Persian carpet) which allowed this ‘infolding’. We can say this 'white' iteration chooses a utilitarian organization. 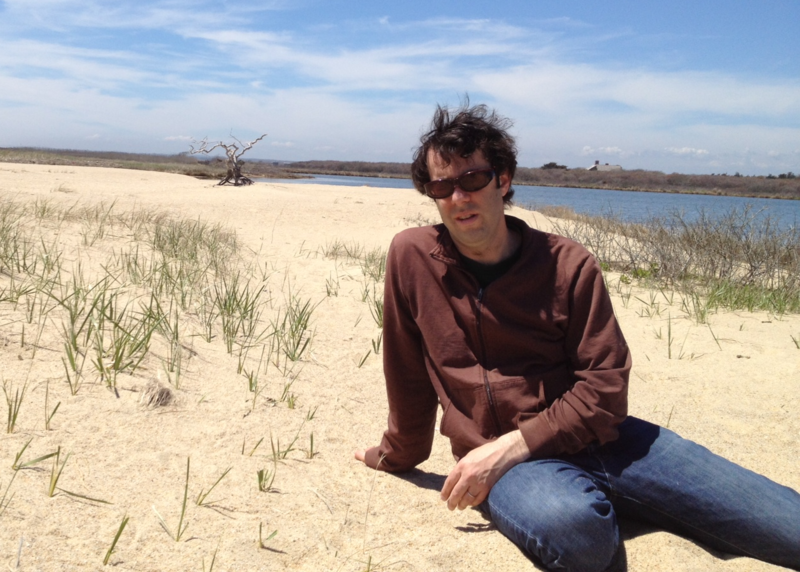 Dean Rosenthal in situ on Martha's Vineyard. Photo by Debby Rosenthal. When we came back a season later, for the 'black water' iteration, this was no longer the case. With the second version of the score, shot at the spring equinox, we took a couple of cues from the 'white' version: namely that we used the exact same location (and I do mean exact), but this time, at night, under the full moon, we filmed just the reflections of the moon on the surface of the water. This time (which is something I am always looking for) the image fulfilled the conditions of being 100% concrete (moonlight on water) yet also wholly abstract — apart from one or two moments, which I suppose could therefore be said to define a narrative. It was still cold. We prepared the rocks better this time, so there was less running about and loss of breath. But what crucially intruded was not the light (or its absence) but the sound of the wind: at times peaceful and recognizable, at other times overloaded, distorted and, I would say, embodying an anger. These takes, this time, were cut together from the soundtrack. It's the kind of thing which can, and could, be done seasonally, and in all probability will produce at least a third iteration. Perhaps you could even be present for that? Or perhaps you could create the images, and I would 'invisibilize' myself, bringing the score full circle? I listen carefully to the sonic imagery, but I am equally engaged by contemplating the visual images and composition. The site, www.stonespiece.com, is entirely devoted to the piece. This article first appeared in The Journal of Wild Culture on April 28, 2015. 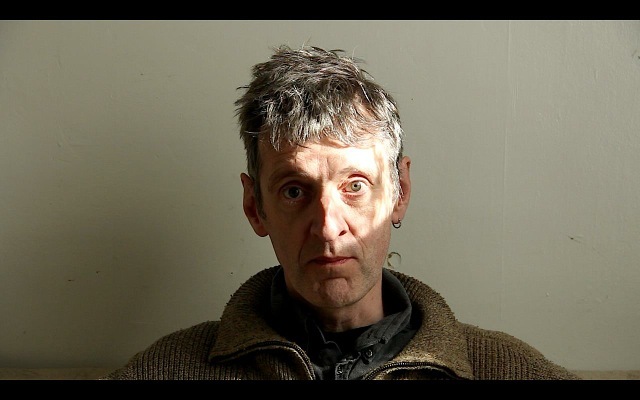 RUSSELL CRAIG RICHARDSON is a British born screenwriter, filmmaker and video artist who has worked extensively with neo-classical composers and poets in the past decade. His recent praxis involves staged installations where the conditions of viewing are the vital element in the 'seeing' of the works. He uses a variety of audio-visual media, both analog and digital, with an emphasis on collaborative and performative aspects of the works. He currently lives in New York.